But why pay for RTX when nothing meaningful has been used? Ray tracing isn't something brand new. What l was trying to get at is the new 7nm Radeon 7 is barely any quicker than an RTX 280 (which provides RTX capabilities as well) yet the AMD GPU will consume significantly more power (300W TDP) than the RTX280 (215W TDP). Where is AMD wasting all the power and why has Nvidia got such a perf per watt advantage? As a bystander I see Vega as a very inefficient power hungry architecture for gaming and unless AMD pull something out of the bag for Navi we should temper our expectations for PS5. To all those speculating that Radeon VII being Vega suggests anything negative about Navi, I would argue that this isn't necessarily true. Vega 7nm is very much the current iteration of GCN scaled to the limits of the architecture and shrunk to the 7nm process node. We know beyond 64CUs the current incarnation of GCN hits diminishing returns quickly, so the benefits of 7nm are only seen with the power consumption and clocks. Providing more ALU versus pushing clocks will always give you more bang for buck in terms of performance per watt, whereas they aren't able to do that with Vega without fixing the bottlenecks of the architecture with significant changes which in effect is what Navi will represent (if not even an evolution or revolution of AMD's GPU microarch). Navi can and will go beyond 64CUs, so raw FP performance at Radeon VII TDP will beat the snot out of Radeon VII. Which to me at least, promises a much better proposition for next-gen consoles. AMD is aware of what it will take to accelerate ray-tracing, and already has tools for rendering in professional applications and real-time. It’s understandable they didn’t push the envelope for consumer graphics because developer adoption is key. This paper and patent shows they’ve been considering HW accelerated RT for at least 4 years. Doing RT acceleration on a separate die is likely impractical. You want the existing architecture modified for it, just as Nvidia has done with Turing. AMD has been behind the game compared to Nvidia ever since Nvidia fixed Fermi’s power dissipation. Nvidia can hit higher clocks at much lower power. This has to do with architecture sure, but they’ve probably cooked up some transistor level optimizations that AMD needs to catch up on. Perhaps the Zen engineers helping them out will make baby steps towards that. Yes, Vega 7 burning 300W to hit those numbers is bad, but AMD’s own metric says Vega 7 should also be able to match existing Vega 64 performance at half the power. Throw some architectural advantages on top of that, and you’re in the 150W range, still at 12TF, and hopefully better than Vega 7 clock for clock due to Navi’s improvements. Do we have data on how much Vega 10 consumes at 1.5Ghz? You are also not understanding Double Precision that Radeon 7 can do which is huge for conetent/miners. That's the major reason TDP is so high, it's why vega's was so high, but vega was imbalanced because certain things were cut down, and it was on a different node. It had 64 rops,64 CU's. But was memory limited in speed, and bandwidth starved. Radeon 7 is not. It runs much higher in frequency, and has 4 stacks of HBM2. I honestly believe through some driver updates to take full advantage you will see huge gains in adobe, among others using that 16gb's. A Recession in 2019-2020 is extremely likely. If we hypothetically get into a great recession that is as bad as the financial crisis of the previous decade, how do you guys think it will (if it all) affect the launch of Next gen Consoles? I'm not sure how to expect a midrange Navi APU to be such a revolution, that it provides Vega VII power at half of the cost and power consumption. It could have a similar affect to tarrifs. Sony/MS scale back specs to meet a certain price point. They have to commit to this stuff ahead of time though, so they could easily be caught in these circumstances. They’ll get power down by decreasing the clocks and make up for it in architecture gains. They’ll get the price down due to 7nm maturity and GDDR6 over HBM2. Frankly,at this point,i am highly skeptical of Navi. Now explain how they do all that, reach ~14TF of performance, pair it with Zen 2 on a low power APU, and package it with everything else in the system at $399 or $499. David Blaine and Harry Houdini would tip their hats. Navi has to be one of the most revolutionary architectural shifts we've seen in graphics for decades for all of this to come true simultaneously. Between your post an mine there are 5 facets (power consumption, horsepower, APU size, price, efficiency) and you can probably only pick 3 for your console of choice. Otherwise Navi has to be magic. We have no new information about Navi from yesterday besides release date. We have no new information on 7nm Vega except game benchmarks and the possibility of of 128 ROPs, so there’s very few conclusions to draw now that couldn’t have been deduced in November. Most people aren’t saying 14TF, and most of the people that are recognize that as aggressive. The majority of productions have fallen between 10-12TF, which is very doable based on the power scaling AMD has advertised for 7nm. Vega, is trash. Its a super rushed architecture becasue AMD was so focused on Navi that the whole Vega architecture was botched. Navi however has been worked on for a long time with help from the console manufacturers to make sure it is the best it can be for them. Navi will deliver, i have yet to lose hope on that. I dunno...maybe i am too skeptical but after Polaris and Vega i really don't expect much at all from next AMD GPU.The best we can hope for is that Navi is simply "good enough" or that Sony invested lots of money in their own semi custom Navi version for PS5. I hope we'll find out sometime soon. So I've been following these discussions for some time but I don't understand the technical aspects of this. If it looks likely that the PS5 would have a minimum of 10 tflops, would that mean that every game could run at 4k60fps? I don't know what my expectations should be at this point and would like to get some sort of grasp on them. the proof is in the result. Vega is very power hungry compared to what it should be. It's obviously not nearly as good as it could have been. And i prefer if sony is shifting the focus of Navi, means that Navi will be able to use at it's best. I dont care if Vega is bad. I care about Navi being good. Every game 'could' if developers decided to target that. But many developers prefer, and will prefer, to spend performance on prettier pixels rather than more pixels, or higher framerates, no matter how much power you give them. So no, no matter where the consoles come in, not every game will be 4K/60. I expect we'll still have (many) 30hz games, and many games preferring to reconstruct up to 4K rather than render natively, and to spend power instead on more expensive (read: hopefully higher quality) pixels and rendering techniques. I see, thanks for your answer. Hopefully it feels like enough of a jump from the Pro to be worth it. I don't think Vega was rushed, it's R&D budget was just laughably small, since the focus most of theit R&D resources on Zen. If AMD had the money they probably would have left GCN already behind. If Navi is for their GPUs what Zen was for their CPUs, a 14TF or higher console for 400$-500$ should be possible. It wasn't rushed it was somewhat sabotage by AMD taking engineers off the project when raja was there for their CPU line. If that’s true, it was a smart move on their part. Zen is responsible for their resurgence as a company. Vega 7 sees a 29% performance boost on average despite only a 12% compute advantage over Vega 64. Regress the clock increases (to halve the power) and you have a net 12% performance boost. As long as Navi can manage parity with that, it should be a decent chip. The hopes of 1080 Ti / RTX 2080 still seem within reach. Navi could be less than 20% faster than Vega architecturally and hit that metric at 150W. Vega has some untapped potential, due both to poor feature support from AMD and lackluster industry adoption. Those will change with Navi. Their focus on Ryzen/threadripper/Epyc and pressure from Lisa Su for the company to focus on semi conducting lead to that. Raja move to Intel was a interesting one same for Jim Keller. Vega 64 performance with a Zen CPU should get people extremely excited. Expecting more than that because Navi magic is pure hopium intake. It will all come down on the developers, they won’t have a lack of power. I do hope Sony’s first party titles feature both a 30fps and 60fps options like we have seen in a few of their games like God of War where you have a performance mode to unlock the frame rate. That is what i am expecting. But the difference is, that Navi will get that level of performance on a mid range card. Vega only reaches that by going for very high watts. Vega 64 level of TFlops but with better features and faster memory bandwidth would be delicious tbh. I want them to go all out , when we get a mid gen upgrade sure but not at the start . "Amazon is developing a service for streaming videogames over the internet, joining Microsoft, Google and other companies that are building similar offerings in what could be an important new battleground in online entertainment, two people briefed on the plans said. Streaming services represent a potentially significant shift in the games business by, in some cases, eliminating the need for players to purchase expensive hardware, such as consoles or PCs, to run the most elaborate titles. Instead, the games run on powerful computers inside data centers, allowing people to play them on devices with less processing muscle, including smartphones, tablets and smart televisions. Amazon has begun talking to games publishers about distributing their titles through its service, which isn’t likely to be launched until next year at the earliest, said one of the people briefed on the plans." Naughty Dog went with 30fps in the single player campaign of Uncharted 4 because the CPU wasn't good enough for 60. I think you'll see them go for it again with their PS5 titles. And devs like Sucker Punch won't be fully utilising those Zen 2 cores anyway. Only a few devs have the budget and scope to achieve that imo. Nah they are part of the Sony group of course they can have budget and tech know how with help from other Sony devs . Even more so if GOT end up selling really well and it looking like one of Sony big AAA \high tech games. I think you forget how impressive ISS was for a year 1 game. Naughty Dog went with 30fps in the single player campaign of Uncharted 4 because the CPU wasn't good enough for 60. I really hope they go 30 w/ higher fidelity. I don't need their cinematic games at 60fps. Would rather see more realism, animation and detail in games like UC and TLoU. Their games play better at 60 to me tbh. TLOU Remastered is so, so much better at 60fps and the same goes for the Uncharted Collection. I think compared to VEGA that NAVI will focus on a better watt/performance ratio. Can only benefit the consoles. Nobody has an excuse for 60fps come next gen since Ryzen will be around. This was posted 30 days ago. Ryzen won't change you can still do more at 30fps than 60fps . Plus we still at a point where it matters even more so if you want to talk about things like RT or certain other effects. Seem like a repeat of the rumours we hear before . This article is from June 12, 2018. I disagree. Everything feels too loose and lacks weight. I always come out top 2 in factions locked at 30 but near the bottom at 60. Yeah, I don’t see how you draw that conclusion. 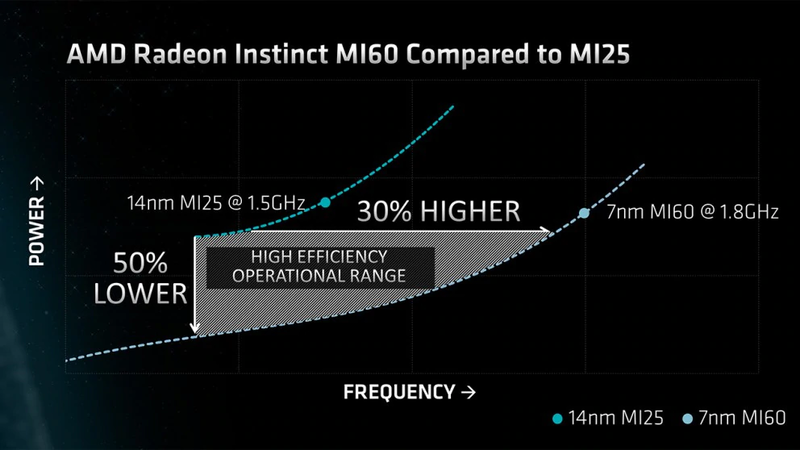 If anything, it looks more like Vega was an incremental improvement to Fiji that AMD has been forced to squeeze harder in order to justify R&D and production costs while they get Navi into a good position. Even Vega 56 with a Zen CPU would be a huge leap. That is my personal opinion of what should be an expectation for the PS5. Next Xbox gonna be Vega64 then! With first-gen ryzen, GDDR5, and Vega 64 on 16nm process. 350 watts box. I'm sure many games will still offer a choice of performance and graphics options, but Ryzen should definitely allow for a lot more 60fps games next gen, while still allowing for great graphics, detail, realism, animations ect. Old article summarising what we know of from elsewhere. Regarding timelines it seems obvious that PS5 is Navi 10 and arriving ~18 months or so later is Navi 20. Looks like Navi 20 is for PS5 Pro which will likely arrive mid generation for consumers. Lisa Su’s full roundtable interview is up. She touches on ray-tracing on Navi, but not much more than has already been shared.